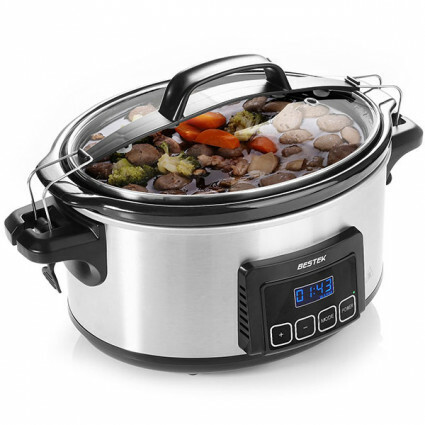 BESTEK programmable slow cooker with timer function and large capacity, allows you to prepare for any slow coking recipes in advance for your whole family easily and smartly. Three programmable cooking modes (High/Low/Warm) allow you to cook for your need. Digital controls enable you to adjust cooking times from 30 minutes to 20 hours; count down timer lets you to arrange your time. 6 quart capacity oval stoneware is perfect for meals for over 7 people. Removable and dishwasher free oval stoneware makes clean easy. 1.Add your ingredients, cover with the lid. Then lock the lid. 2.Plug in your BESTEK programmable slow cooker. 3.Pressing the mode button to select from high, low and warm mode. Then the digital screen would show your selected mode. 4.Pressing the “+” or ”-“ button to adjust the time. Each press would add or reduce 30 minutes. Long press to fast forward/rewind. 5.Press the power button to start cooking and the timer would begin to count down. 6.You could adjust the mode or time anytime during the cooking.